Estimated Sunrise on CairnGorm Mountain today is at 05.49hrs and Sunset at 20.36hrs. This camera operates from infrared first light till shortly before visible dusk. 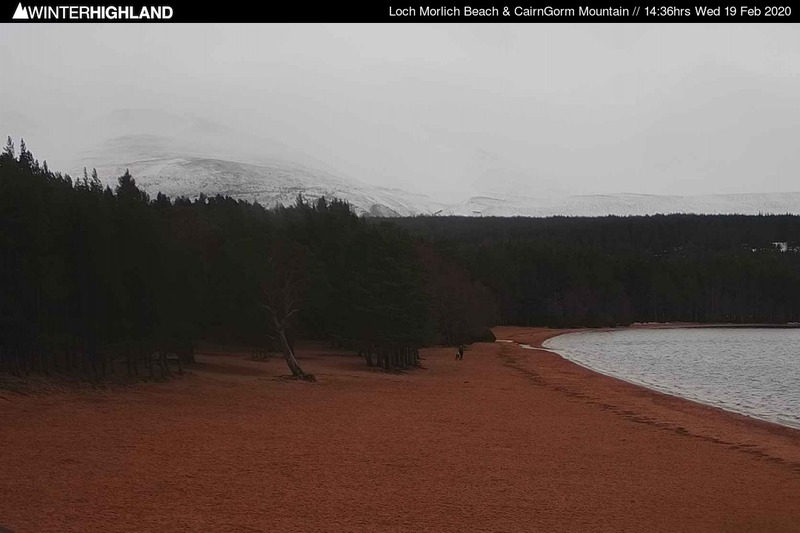 Winterhighland would like to thank Loch Morlich Water Sports for their ongoing support and assistance which makes the provision of this Webcam possible. CairnGorm from Loch Morlich. First image approx. 05.09hrs. Last image at 20.56hrs. This Camera looks towards CairnGorm (inc. Northern Corries) from the Boathouse at Loch Morlich, showing Coire na Ciste at the Eastern edge of the image, the Windy Ridge, Coire Cas, Coire an t-Sneachda and Coire an Lochain. In clear visibility with snow on the ground the Ptarmigan Restaurant is clearly visible. This camera is useful for assessing snow level & cloud base as well as low level snow.